Harry Connick Jr. appeared as a guest judge on the Australian television show Hey Hey Hey it's Saturday and spoke out against a shameless blackface performance that was billed as a "tribute" to Michael Jackson by the "Jackson Jive." Speaking not as a white American but as an American, Connick expressed his disapproval to the blackface jive saying, "we've spent so much time trying to not make black people look like buffoons that when we see something like that, we take it really to heart..." We can't figure out what's more outrageous -that the host apologizes to Connick for offending him (not black people), that the entire Jackson Jive troupe are now (supposedly) highly educated and are doctors, or that Jive did the same routine on the same show 20 years ago AND WON! Rachel Christie was crowned Miss England at the annual pagent at London's Metropole Hilton Hotel on Sunday. The London born 20 year-old is the country's first black title holder and will go on to compete for the Miss World crown in Johannesburg South Africa in December. Christie is planning on competing in the heptathlon events at the 2012 London Olympic games. "My ambition in life is to compete and win gold in the 2012 Olympics," Christie said. "I would also love to do well in Miss England. I want to be successful in whatever I choose to do in life." It is to be noted that Christie is the niece of the most decorated British athlete, Olympic gold medalist Linford Christie. He is considered the second fastest European in history and has a stadium in West London named after him. 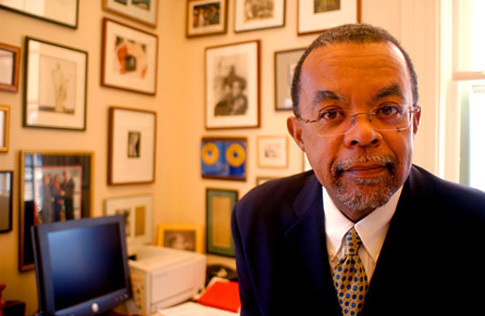 Henry Louis Gates Jr. attended the Martha's Vineyard Book Festival on Sunday and revealed to the crowd that he has had to change his cell phone number and shut down his public email after receiving death threats in the wake of his arrest. "The University encouraged me to move," Gates told the crowd explaining that the situation has been "stressful" yet insisting, "lot's of people go through far worse things, and I mean I was in jail for four hours, not four years or four months or four days, so I don't want to exaggerate the trauma." Gates also joked about the "beer summit" he attended with the arresting officer Sgt. James Crowley saying, "he offered to get his [Crowley's] kids into Harvard if he doesn't arrest me again." Obama As Heath Ledger’s Joker in ‘Socialism’ Poster Appears In L.A. 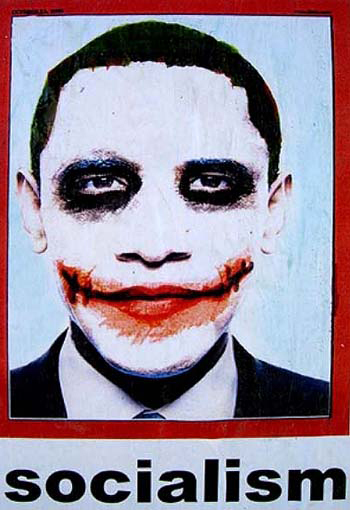 Posters depicting President Barack Obama as the Joker character from the Batman series Dark Knight with the word "socialism" across it have been appearing in Los Angeles causing some to cry racism and others to call it political commentary fail. The posters are believed to be part of a campaign by conservatives who do not agree with Obama's policies, but as yet is unconfirmed. The creator of the poster is also as yet unknown. Critics have already accused the Joker depiction as being racist because of the similarity to the "blackface" caricature. Rightpundits.com scoffs at these racist claims and makes a rather good point saying, "There’s nothing racist about depicting Obama as a famous movie character. The poster equates him to a famous clown which had large red lips. If you think this is racist, I guess a black man can never dress up as a clown." "If I had to design the poster I would’ve turned Obama into Mao or Lenin," Rightpundits goes on to say. What does this poster represent to you? Propoganda, racism, or just great pop art. 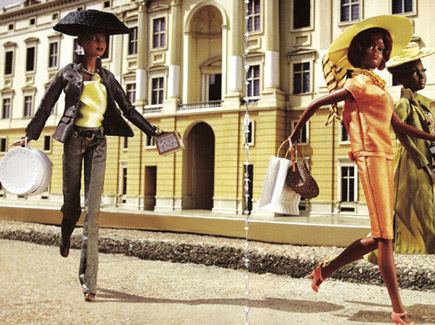 Italian Vogue's editor-in-chief Franca Sozzani made a bold statement when she featured only black models in the 2008 July issue, and follows it up with a feature on Black Barbies in the 2009 July supplementary issue celebrating the 50th anniversary of Barbie. "Barbie has been an icon for wole generations which is why I really wanted to give a strong sign in step with the times, and dedicate the anniversary issue to Black Barbie," Sozzani said. Introduced in 1967, the first black doll from the Barbie collection was Francie, a friend to Barbie. 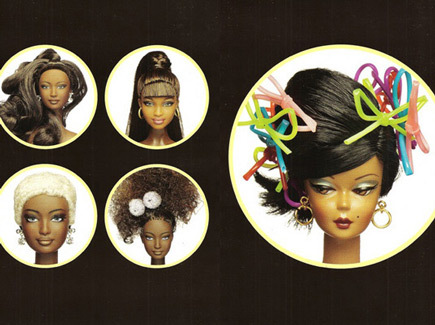 The first Black Barbie wasn't introduced until 1980. This fall Barbie launches a line of black dolls called the So in Style collection with more ethnic or "black" facial features such as fuller lips, distnctive cheekbones, a wider nose and curlier hair. The 2008 all-black Italian Vogue served as an example of the virtual exemption of black models in the beauty and fashion industry and the need for diversity. So what will Vogue's Black Barbie issue achieve? Perhaps, the elevation of black female aesthetics to Barbie's iconic status. Or at least young girls like Sasha and Malia will have some great dolls to play that will reinforce their self-image as beautiful black women. President Obama commented on the recent arrest of Harvard Professor Henry Louis Gates at his Boston, Massachusetts home at a press conference on Wednesday saying if he himself tried to "jigger" his way into the White House he'd "get shot" -which got a big laugh from the roomful of reporters. The President went on to say, "I don't know, not having been there and not seeing all the facts, what role race played in that, but I think it's fair to say, number one: any of us would be pretty angry; number two: that the Cambridge police acted stupidly in arresting somebody when there was already proof that they were in their own home; and number three: what I think we know separate and apart from this incident is that there is a long history in this country of African Americans and Latinos being stopped by law enforcement disproportionately -that's just a fact."